Mayor Taveras is unveiling his Economic Development Report . PROVIDENCE, RI – Mayor Angel Taveras today announced a 20-step economic development action plan to put Providence residents back to work and jumpstart the economy of Rhode Island’s Capital City. The Mayor said that Providence’s economy must be built on the success of a broad range of industries and sectors, and pledged swift action to improve Providence’s business climate, infrastructure and human capital. Freeze the commercial tax rate – The Taveras administration will work with the Providence City Council to enact a seven-year commercial real estate tax freeze that guarantees consistency and stability for developers in Rhode Island and beyond. “Freezing our commercial property tax rate will send a message that Providence is serious about attracting new business. We look forward to the day when economic growth in our City enables us to actually lower Providence’s commercial rate,” Mayor Taveras said. Fix the City’s Permitting Process – Contained in the FY14 budget that Mayor Taveras will present to the City Council next month are two positions to staff a new unit in the Department of Inspections and Standards focused solely on reviewing and approving small-permit applications of under $100,000. These small projects account for 75 percent of all permit applications in the City. Additionally, this summer the City will move its permit application process online. For the first time, developers will only need to log onto the City’s website to apply for a permit and get status updates on their applications. Remove Barriers to Redevelopment – The City will conduct an inventory of all major properties in need of redevelopment. For properties that are not defined as historic landmarks, the City will put on a fast-track for approval all projects to replace existing structures with new construction. “We recognize that the City has an important role to play in facilitating new development. It is time to get cranes in the air and put people to work rebuilding our city,” Mayor Taveras said. Develop Surface Lots Citywide – To stimulate real estate development and ease the crunch on parking downtown, the Taveras administration will work with the City Council to provide tax stabilizations to developers who commit to new development on existing surface lots. New construction on an existing lot will be taxed based on the property’s current assessed value. This program will create jobs, incentivize new, mixed-use developments, and spur new investment on Providence’s major commercial corridors. Reinvent Kennedy Plaza – The City will work with the Downtown Providence Parks Conservancy, RIPTA and other public and private partners to reconfigure and reduce the number of buses in the Plaza and transform it into a pedestrian destination. Other actions outlined in Mayor Taveras’ 22-page economic development plan include providing targeted, operational support to small businesses, and reimbursing main street businesses in every neighborhood for their storefront improvements. The City will also work with Providence’s community development organizations to rehabilitate foreclosed properties and create an up-to-date database of properties across Providence that are available for development. Mayor Taveras also announced he will launch a regional marketing campaign that invites visitors to “Come to Providence” and enjoy the City’s acclaimed restaurants, museums, parks, zoo, festivals, theaters, shops and arts events. “This action plan presents a roadmap to a new era of opportunity and prosperity for Providence. I am excited to work with my team to implement these actions and accelerate economic growth in our City,” said James Bennett, Providence’s Director of Economic Development. 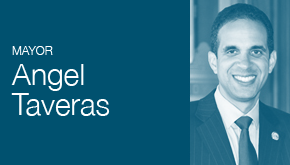 Since taking office in January, 2011, Mayor Taveras has worked with the City’s labor unions, retirees, tax-exempt organizations and other stakeholders throughout Rhode Island to successfully tackle a $110 million budget deficit. Next month, Providence is scheduled to complete a municipal pension reform that has been described an unprecedented example for other cities to follow. “Through hard work and shared sacrifice, we have saved Providence from collapse and built a solid fiscal foundation upon which we are ready to grow our City’s economy,” Mayor Taveras said. The Mayor unveiled his economic development plan at a special trustee meeting of The Providence Foundation attended by more than 120 leaders from Providence’s business community, educational and health care institutions and community groups. The meeting was held at Brown University’s Institute for Computational and Experimental Research in Mathematics (ICERM). On streetcars, Taveras says Prov “will aggressively pursue a sustainable funding strategy” to get them built. No details. Taveras: commercial pro tax rate too high. We need to lower it but are not in position to do it yet. Other parts of mayor’s plan include making better use of PEDP; streamlining permitting; locking down funding for streetcar system. I’m not ready to freak out about the demolition fast-track just yet, although I was a little surprised about this being one of the proposals. It also includes housing rehabs, zoning updates to support transit oriented development, and incentives for building on surface parking. The key will be following up on the progress of the stated goals and holding accountable those tasked with theiir implementation, especially the mayor and city council whom we directly elect as well as the various commissions that solicit public comment. Most large-scale projects, even with fast-tracking, take 2-years. This would mean that a developer would not only have to pay for the approvals process, but would have to develop a fully designed and engineered set of construction documents and obtain a full building permit in order to meet the 18 month requirement. That’s having a lot of skin in the game to just walk away from. The city could also require a contractual agreement that financing would have to be in place before any demolition were started. yes!!! development on surface lots! It’s about time! Call me optimistic Olly, but I like this report <3 Having a mayor still speak about street cars in Pvd is hope for me (state motto), and a sign that others such as us, should do something to push this to reality… because it isn't a dead idea yet. call me a pessimist (or a realist) but this sounds more like smooth talk from someone who wants to be governor. All this stuff takes time. Time that is ticking on a mayor who isn’t running for re-election as a mayor. So he can talk all he wants, he is basically lame-ducking Providence, while paying lip service to the electorate. And I’m a fan of Angel. And I’m all for reports that genuinely try to fix the problems the city faces. But this is a seriously LONG TERM VISION, and i think the Mayorship of Providence shouldn’t be constantly used as a stepping stone to something else. One concern that I think bears watching is the wish to “reinvent” Kennedy Plaza by “reducing” the buses there. Where are passengers and the buses to go? While improvements for passengers are needed as well as for the overall value of KP, I know from long experience that interests of passengers are often a bottom priorities of the movers and shakers, and access to shelters, security, bathrooms, transit info, and ease of transfers can be at risk if the “reinvention” is not done right. I thought the Kennedy Plaza proposal was interesting, because I assumed it meant putting the buses near the train station, but someone informed me that that’s not actually possible because of weight limits at the station. It’s also a worry because it’s bad enough perhaps to have the buses separated from the trains, but if they were all in one place it wouldn’t even necessarily be good, since that place would still be a part of town that’s surrounded by wide highway-like streets and little to walk to outside of the mall. I, too, am annoyed by the mayor vying for governor, and sort of feel that we ought not vote for someone who doesn’t finish the job where he is. Another term here and something on the ground to show for it and maybe he can talk about governor. Currently, the area that one might call, “Kennedy Plaza proper” (with other areas such as Burnside and the Skating Center being “Greater Kennedy Plaza”), is basically a single use area, people waiting for buses. Any single use area, be it a bus stop, a residential only street, a row of lightly populated labs, or even a robust nightclub area, is not ideal in a dense downtown urban environment. Urban environments want to be mixed-use. To make a city come alive, you need a multitude of uses happening throughout a space throughout the day and evening. In the case of Kennedy Plaza, the worst elements of the bus riding population are the most overt (though they are the minority), because the rest of the riding public is resigned to put up with them, and no one else is in the space trying to do anything else. RIPTA’s COA is allowing them to rethink how routes pass through the city, and identifying ways for them to better use the Plaza, which is currently beyond capacity and not working ideally for them. RIPTA thinks they will be able to reduce the number of berths at Kennedy Plaza allowing for the concentration of berths and bus travel lanes to also be reduced, allowing for other activity to bleed into the area where the buses are now. The buses are not going away, the number of buses, and the amount of time they dwell at the Plaza will be reduced. Bus riders are an important element to enliven the Plaza, the number of passengers moving through the Plaza each day is massive, no place in the city sees anywhere near as many people pass through. De-emphasizing the single use of buses and bringing other uses in for bus riders and to attract the public at large will create a multi-use environment, tamping down the problem users who ruin the reputation of RIPTA in the Plaza and the use of the Plaza for everyone. The goal of making the Plaza a more attractive place will have the benefit of making RIPTA more attractive to people who do not use the system now and are put off by their perception (real or imagined) of the Plaza. Making Kennedy Plaza multiuse is a great idea. I definitely support that. The mayor should just call it that. Would there be a reason businesses would object to that wording? I think “reduce” has been the goal for so long, and though the thinking behind that word is faulty, it is the word in use, and explaining “mixed-use” is hard. Mixed-use is something that most of the people who read this site get instantly, but it is actually kind of a high level concept for most people. “Reduce” is not factually incorrect, there is likely to be some reduction in the number of berths, but it is not really the higher level goal. The business leaders who ring the Plaza are learning what mixed-use means and are all for it when they understand it. Some of them understand it more than others. There are some people who would like to see all the buses gone, but that really just moves the perceived problem somewhere else. Kennedy Plaza has been the center of transportation for Rhode Island for centuries, it has worked well and not so well at various times throughout the generations, the current plan is to try to make it work well again. There’s a lot about the current configuration that works, perception and aesthetics are the key problems now. The programming that has taken place in the Plaza area over the last several years, combined with increased police presence and greater cooperation between Parks, RIPTA, PPD, the DID, and others has resulted in a dramatic reduction in the rates of crime in the Plaza. The next step is to address the aesthetic issues which will go a long way towards tempering the perception (some perceptions deserved) of the area. Who wouldn’t share Jef’s goal of a vibrant mixed-use KP, I do! But its not “panic” – transit users have a right to be concerned how its done. In recent history bus passengers (perhaps because not organized and often low-income) have been pushed out of the Woonsocket Depot, relegated to waiting on a driveway at Thayer St, some towns have resisted shelters, some shopping centers have not allowed buses, Pawtucket tried to eliminate their bus hub, and when KP was redesigned to allow eastbound cars to drive thru (it had been an auto-restricted zone) as Mayor Ciance insisted, there was not enough space left for passengers on the outer boarding islands. Even rail passenger interests were of low priority when the rr station was moved away from KP with little attention to drop-off lanes, short-term parking, bus connections, or the pedestrian experience walking back to downtown. Even highway signs referencing the station took years to put up. To transfer buses on a cold dark night across Burnside Park can be intimidating, especially for seniors or disabled folks. I wonder how many at the Providence Foundation event will have to do that. Its not clear to me how Ripta could be “over capacity” at KP and still want to reduce the # of berths. Likewise,why is the COA proposing to reduce the lines that run thru (interlining) which would result in increasing the need to transfer there? For me the bigger picture over the decades I’ve lived here is the failure of Providence leaders to promote, improve, and emphasize their one transportation advantage over the suburbs – good transit access, now including commuter rail, from every direction. Instead they have always largely tried to compete with the suburbs just by accomodating cars. This has been a losing strategy as if we are to have a real city at all, parking will never be as cheap and convenient as in the suburbs. KP is overwhelmed by buses because every route goes there. It does not have to be that way. The hub and spoke bus system is a legacy of the time when a streetcar line would be added when someone thought it would be profitable, which meant it had to go downtown. Our route map is mostly historical accident. A system designed from scratch would be more like a grid than spokes. Only a few high frequency lines need to converge at KP. These lines meet local crosstown lines at transfer points all over the city. Existing one-seat-to-KP riders who would suddenly have to transfer will complain bitterly, but the system-wide benefits will be great. Thousands of trips that are now impractical by bus, where neither endpoint is downtown, will be enabled. Neighborhoods that now see only infrequent service to KP would be served by a high frequency local bus that always provides a quick transfer to a rapid line to KP and which connects to other non-KP lines. For instance, the bus that now serves Riverside actually spends most of its time trundling in and out of Providence. Instead, it should travel between Riverside to central East Providence twice or more as often with convenient transfers to the #60 and some other rapid, high frequency line into Providence. This is a cautious half measure which will yield spotty results for the urban fabric but a windfall for a few wired-in developers, unfairly at the expense of existing taxpayers. The transformative policy would be to phase in, over a period of years that gives everyone a chance to start building or sell to someone who will, a property tax based solely on land value. Owners of existing buildings will see little change or a drop in taxes. Owners of downtown parking lots will face the same tax bill as if the lot contained a skyscraper. The price of vacant land will fall, lowering the cost of new housing and commercial buildings. I don’t see a legal way to retroactively change the tax rate on empty (ie., parking lot) property, because I think (but I’m not sure) that it would be challenged in court. All those parking lots are going to be “grandfathered” in and basically the new tax rate (if that’s what we’re talking about here) would apply only to new empty parcels. I think instead there have to be incentives for building, rather than disincentives for not. If it’s really just a matter of weight limits at the station preventing buses from relocating there, then that’s a problem that needs to be solved. Let’s face it: we’re not going to be picking up the Northeast Corridor and moving it back to KP. Hell, objectively speaking, any attempt to touch those tracks at all is probably going to be the fastest way for us to lose our mainline Amtrak service and get downgraded to eight-or-less-round-trips-daily on the Downeaster/Empire Service-esque “Shoreliner” as mainline and high-speed rail service moves out to Worcester. I’m pretty sure we don’t want to have that happen. Nevertheless, the current state of affairs – with our bus service and our rail services completely disconnected from each other – is similarly unacceptable. So, if doing nothing isn’t an option, and moving the train station isn’t an option, then the only option remaining is to move the buses to be co-located with the trains. The best way to do this would be to move the bus berths (and do whatever re-enforcing and re-engineering is necessary to facilitate this) onto the existing Station Park, and give the existing Kennedy Plaza land (as well as Washington Street) over to City Hall Park in exchange. If done competently, this shouldn’t even need the entirety of the existing Station Park land, which means we can more than likely work around the sections that are directly above the track. Jen C, how is changing the property tax structure, over a phase-in period, retroactive? Perhaps retroactive was not the word I wanted, but the the city is running out of buildings they can turn down and into parking lots, so going foward i don’t see that changing the tax structure is going to get all the undeveloped lots developed unless there’s an incentive rather than a disincentive. If the undeveloped lots tax rate changes in some way, then you can’t apply it retroactively, because all those lot owners would take the city to court because it is akin to a “taking” (in my legal, non professional opinion.) It would be like changing the zoning on your R1 house to it being C4 and taxing accordingly. You might be able to do that going forward, to discourage C4 buildings in Residential areas, but you can’t start taxing homeowners as though they were heavily commercial buildings. Or am I completely misunderstanding Angel’s plan, because that’s certainly a possibility too. Since moving south I find I have gotten mucher dumber. You are misunderstanding the plan the Mayor has put forth, which is that he would agree to continue to tax any property that is currently a surface lot at the same value it current holds if you develop on top of that lot for 3 years. So basically, whatever value the improvements you put into the lot brings to the property is not taxed. Then, the additional value will be phased in over 9 years. It’s a pretty big incentive to develop because you won’t have full taxation on the new value of the property for 12 years. Some of us, however, myself included, want to change the tax system for everyone and have a new land value tax. Essentially you just tax capital improvements to land as property at one ratea and the value of the land itself at another rate. The rate for the land value should be much higher than the improvements. Therefore, more efficient use of the same plot (i.e. deriving more value from a smaller foot print) is strongly incentivized. There is substantially less benefit to holding onto a vacant lot under those conditions and there is a big incentive to develop for higher value uses (dense, mixed use structures) because the largest set of taxes you pay is always going to be based on plot size and not what you use the plot for. This doesn’t have any “retroactive” problems. It’s not targeted. It can be done so as to be revenue neutral. It just greatly decreases the tax on buildings and improvements and switches to land. Owners of tall buildings that extract substantial rent over a small footprint are benefited in this structure over owners of larger properties with far less efficient uses. It’s a great way to drive down the price of apartment structures and drive up single family detached homes. It drives up the price of maintaining a parking lot while driving down the cost of a major building structure. It’s a great tool to fight sprawl and underutilization because it aligns costs with utilization. It’s no more “retroactive” than any change in property taxe rates, but it does generate substantially different incentives for land owners.